Most of the time, the person listed on a property’s mortgage is the same person listed on the property’s title or deed. For example, if a couple buys a home with a mortgage, both spouses are typically named on the mortgage and deed. However, under some circumstances someone may be on the mortgage, but not on the deed. People who are named on the home's title have ownership of the home, while those named on the mortgage have the responsibility of paying for the home's loan. The names on both documents are often the same, but this can change if the deed or mortgage is transferred or if there are co-signers involved. Home loans generally require collateral before a lender will agree to the loan, and the home itself often acts as collateral. In exchange for the money your lender provides, he may require you to sign mortgage documents giving him rights to your property if you do not repay the loan. Once you do pay back your loan, your lender agrees to release your mortgage, giving up his rights. It is this type of document that allows your lender to foreclose on your property if you fail to make your required mortgage payments. However, mortgages only make you responsible to repay the loan, if you are listed on the mortgage and signed the appropriate documents. If you are not listed on the mortgage, you generally cannot be forced to pay it. Deeds, or titles, transfer ownership to a piece of property. A deed is not a sales contract or promise to convey property; the deed actually conveys the property. Deeds include a legal description of the real estate, such as the lot number in a named subdivision, as well as the name of the person giving up the property and the person accepting the property. Different types of deeds are used for different situations, but warranty deeds are most common when unrelated parties transfer ownership because they allow the person transferring ownership to guarantee he actually owns the property he is transferring. For example, when you bought your house, you likely obtained a warranty deed to the property from the previous owner. Since the deed establishes ownership and the mortgage establishes responsibility for paying the loan, a person listed only on the mortgage but not on the deed is responsible to pay the loan for the property even though he has no right to the property itself. Commonly, this situation arises when someone co-signs on another person’s mortgage. Co-borrowers, on the other hand, receive ownership rights in the property, as listed on the deed, in addition to receiving the responsibility to pay the mortgage. Property ownership and debt responsibility may need to be transferred because of changes in circumstances, such as when property owners marry or divorce. For example, a couple who bought a house together likely has a mortgage and a deed listing both spouses. 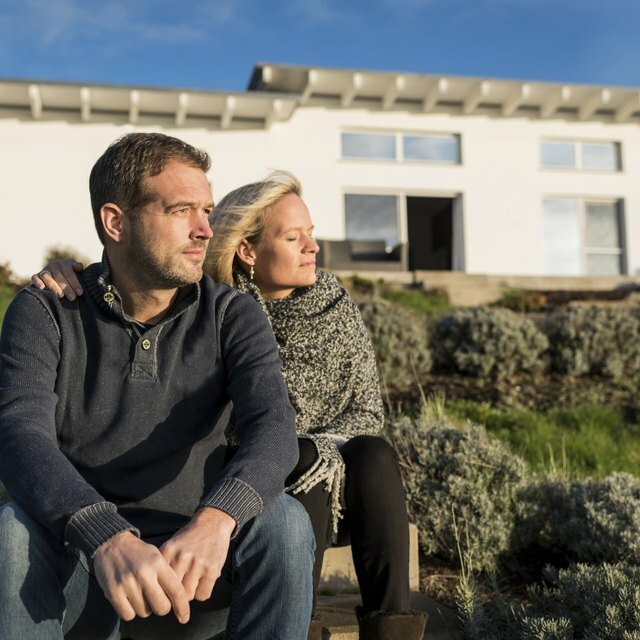 If the couple divorces, they may have to refinance the mortgage to remove one spouse’s responsibility to pay the loan, and that spouse's name will generally be removed from the deed at the same time. Typically, a spouse can transfer property ownership to the other spouse by signing a quitclaim deed. Unlike a warranty deed, a quitclaim deed does not guarantee the transferring spouse actually owns the property; rather, it says the transferring spouse gives any rights he may have in the property to his other spouse. Though spouses can transfer property ownership without addressing the mortgage, both spouses will remain liable on the mortgage until one spouse’s name is removed. Credit Sesame: Mortgage 101 Guide – What Is a Mortgage?